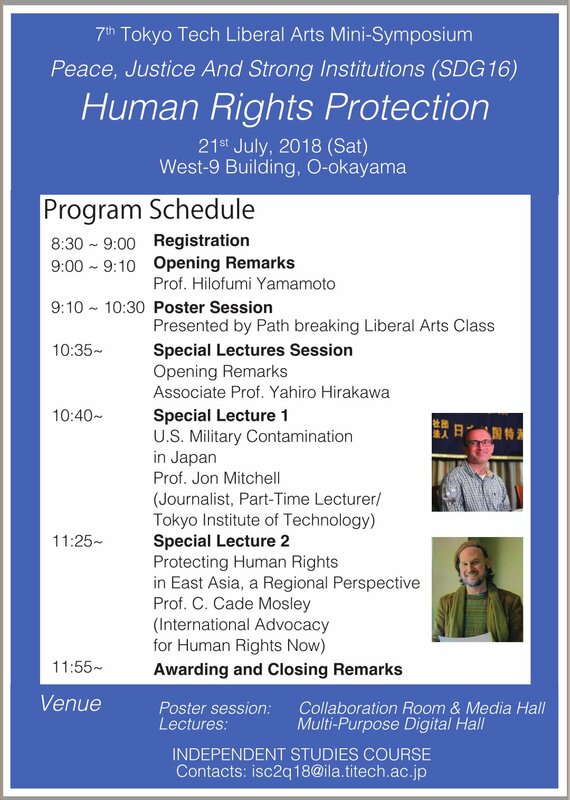 On Saturday, July 21, HRN staff Cade Mosley will give a public lecture in English titled “Protecting Human Rights in Asia: A Regional Perspective” for a Symposium at Tokyo Tech on Human Rights and SDG Goal 16. His lecture will begin from 11:25 am. There will also be a lecture by Jon Mitchell on US Military Contamination in Japan from 10:40 am. The symposium will be held in the West-9 Building of Tokyo Tech campus, Ookayama (map). It is organized by the Independent Studies Program of Tokyo Tech. Contact: isc2q18@ila.titech.ac.jp. You can also contact Cade Mosley with any inquiries about the lecture itself at cade.mosley@hrn.or.jp.